At the HCP conference in Kyoto, we’re expecting to see some updated (and perhaps new) measurements concerning the recently discovered Higgs-like particle. Presentations from the ATLAS and CMS experiments at the Large Hadron Collider [LHC] are coming shortly. First things first — based on the questions I’m getting from reporters and other non-experts, I need to emphasize right away that it is very unlikely that anything dramatic is going to happen here. ATLAS and CMS only just co-discovered this particle in July; the amount of data that is available now is only about twice as much as was available in July, and that is nowhere near enough for the big questions about the Higgs-like particle to be resolved. We will not know after today whether it is a Higgs at all, whether it is a Standard Model Higgs or not, or whether any particular speculative idea beyond the Standard Model is now excluded. What we are likely to see is some incremental changes in what we know. Knowledge about nature does not come easy. We discovered the top quark in 1995, and we are still learning about its properties today — there were over a dozen talks about the top quark earlier in this conference. And we will still be learning important things about the Higgs during the coming few decades. We’ve no choice but to be patient. CMS Higgs decays to lepton, anti-lepton, neutrino and anti-neutrino (using 12 inverse femtobarns of 8 TeV data along with 7 TeV data from 2011.) No unexpected excess across mass range seen except roughly in low Higgs mass region, where excess consistent with 0.74±0.25 of SM expectation if one assumes a 125 GeV/c² Higgs (3.1 standard deviations significance away from no Higgs.) The central value has climbed slightly since July; the error has gone down somewhat. [Reading off a plot from the CMS paper, it looks as though the July result was something like 0.6±0.4 of SM expectation.] A couple of other relatively minor results shown. ATLAS Higgs decay to two lepton/anti-lepton pairs: apparently no update at this conference. CMS Higgs decays to two lepton/anti-lepton pairs (using 12.2 inverse femtobarns of 8 TeV data along with 7 TeV data from 2011.) Old result from July was about 0.7±0.4-ish of SM expectation. Now have 2:1 signal over background; expect 6.5 background, 12.5 signal, for a total of 19 expected; 17 are observed. Using kinematics, find 4.5 sigma detection (compare 3.2 sigma in July). Find 0.8 + 0.35 – 0.28 of SM expectation. Mass 126.2 ± 0.6 ± 0.2 GeV/c² . No sign of any heavy Higgs-like particles. Measurement of spin and parity attempted — claim to exclude pseudoscalar [odd-parity] alternative to scalar expectation; pseudoscalar hypothesis has only 2.4% probability (about 2.5 standard deviations) of being consistent with the data. This makes the new particle, in this respect, even more consistent with a typical Standard Model-like Higgs particle. Plot from the CMS experiment showing that their data on the new particle’s decays to two leptons and anti-leptons (green arrow) is much more consistent with the hypothesis that the new particle has spin 0 and positive parity (purple likelihood distribution) than with the hypothesis that it has spin 0 and negative parity (blue likelihood distribution). This is what would be expected if the new particle were a Standard Model-like Higgs particle. ATLAS Higgs decay to a tau lepton/anti-lepton pair: based on 2011 data and 13 inverse femtobarns of 2012 data (previously ATLAS only had presented a result for 2011 data, so this is a big jump forward — almost four times the data, plus many improvements, I am sure.) Result: neither evidence for, nor exclusion of, the new particle decaying to tau/anti-tau. Rate is at 0.7 ± 0.7 times SM expectation, consistent both with 0 (no Higgs decaying this way) and with 1 (SM Higgs decay). The central value for the Gluon Fusion process is close to 2.4 times expectation and that of Vector Boson Fusion is close to zero, but the errors are huge. Large uncertainties make it impossible to conclude anything yet except that this process cannot be in significant excess beyond SM expectation. 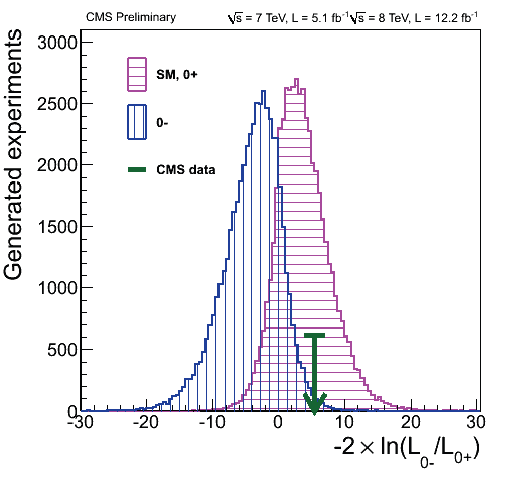 CMS Higgs decay to a tau lepton/anti-lepton pair: based on 2011 data plus 12 inverse femtobarns of 2012 data (previously CMS had presented a result for 2011 and July 2012 data, so this is naively a small step forward — not even twice the data. But what about possible improvements?) Improved missing energy reconstruction; improves resolution and pile-up dependence, which has a big positive impact on the measurement. New event requirements, particularly on events that might come from Vector Boson Fusion. Big changes in the events that actually come into the analysis. Result: 0.72±0.52 times the Standard Model expectation, amusingly almost the same as ATLAS! And similarly, consistent both with 0 (no Higgs decaying this way) and with 1 (SM Higgs expectation). In short, all that hullabaloo about a deficit in the rate for Higgs decays to tau/anti-tau was much ado about nothing. With a better (and very significantly changed) measurement with more data, it’s gone, at least for now. Well, you were warned: this is a very hard measurement, and clearly we will not have a precise measurement of the rate for Higgs decaying to tau/anti-tau for some years to come. Think 2016 for something convincing. ATLAS Higgs produced with a W or Z and decaying to a bottom quark/antiquark pair: 2011 data plus 13 inverse femtobarns of 2012 data. Many big improvements, but… Result: -0.4 ± 0.7 (statistical) ± 0.8 (systematic) times SM expectation; not at all significant yet. Also, reanalysis of search for Higgs produced along with a bottom quark or antiquark (arising in speculative models with more than one Higgs particle) shows no signal in the region where a hint was seen at the Tevatron. Summing up — ATLAS, CMS and the Tevatron have updated some of their measurements (though a few updates are noticeably missing). The main new result that there is now considerable evidence that the new particle is not a pseudoscalar (i.e. negative parity) particle, which means it remains consistent with a Standard Model-like Higgs particle. Meanwhile there are no significant deviations from the expectations for a Standard Model-like Higgs particle — the ones that were hinted at before have either evaporated (for now) or remain unchanged. Also, there is now increasing evidence that the strengths with which this particle interacts with W and with Z particles are in just the ratio one would expect for a Higgs particle of some type; this is a crucial test of whether it is a Higgs or not. However, many of the measurements are still very imprecise, and many other measurements haven’t even been attempted yet. It will be many years before we will have the precision, and the broad range of additional studies, that are necessary for us to draw deep conclusions about nature. Plot from the CMS experiment showing that their data on the new particle’s decays to two leptons and anti-leptons (green arrow) is much more consistent with the hypothesis that the new particle has spin 0 and positive parity (purple likelihood distribution)- means there is no quantum interference, no chirality. Often people will say that the universe is in a ‘Higgs phase’(a mathematical Darwinn’s theory? ), a phrase which draws on very elegant connections between the quantum field theory of particles and the statistical field theory of condensed matter systems. Thank you Professor for clearing my doubts. There is something against supersymmetry: Higgs companions, if any, are moved to higher energies. Not something to tear your hairs off but a news. From these data? Only if you really thought the deviations seen before in b’s and tau’s back in July were significant. I never trusted those results. So much for the web. It was not my personal opinion that LHC would necessarily find new BSM phenomena very soon after it would start running. That’s part of why I was trying to build an institution in New Jersey that would be prepared for the long slog that lies ahead, where we must test and test the Standard Model in great detail, and perform all sorts of unusual measurements in hopes of finding something surprising. Just curious, Prof, is the supersymmetry the only mean towards solving the Hierarchy problem? If not, what are the alternatives? absolutely not; there are plenty of others, including various forms of extra dimensions, theories of composite Higgs particles (including what is called “little Higgs”), and technicolor. Some of these are in more trouble with the 125 GeV Higgs-like particle than others, but supersymmetry is by no means the only game in town. And then there are all the theories we haven’t invented yet — human beings don’t often get the right answer without a hint from nature, via experiment. Do you an idea why no updates for 2 photons decays were presented. They fear there is a bias in these measurments ? It was said before the conference that Atlas found a slightly different mass for Higgs in the two channels, then raising concern on some bias somewhere ? I don’t know enough consistent information to speculate intelligently. He says that indeed it is the discrepancy between higgs mass estimates in the yy and ZZ channel, 123.5 Gev and 126.5 GeV, greater than the incertitudes, that caused them to delay the report of their results for Atlas. Just curious, as a laymen, what would happen if all the measurements that can be done with the LHC are consistent with the standard model?